So it takes a lot of makeup to get it looking like my skin is natural. I know, it defeats the purpose but that’s just how I roll. When I went home for Christmas I packed the essentials, and this was alarming because I realised that I need 9 products and 3 tools as a minimum to get my base looking how I like it. Hmm. So first of all there are three primers in action. Why use one when you can use three, right? Is that the saying? A mattifying one for my tzone, an illuminating one for the rest and a colour correcting one for my alcoholic-inspired red cheeks. Sounds a lot, maybe. Then I go in with one concealer on any blemishes – the MUFE one is heavy duty. I buff all that in with the Real Techniques buffing brush. 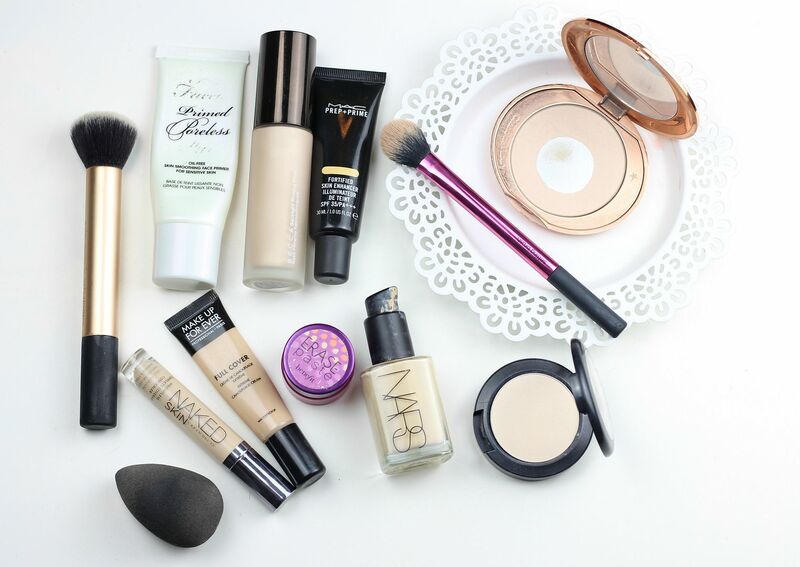 I find that when I apply concealer under foundation, I use less of everything. Then, the actual foundation. This changes everyday depending on how my skin feels. For concealer under the eyes, I use the erase paste as a corrector and then the urban decay as the main event, all blended in with a damp beauty blender. Then a setting powder for under my eyes using the real techniques setting brush and then a separate powder for my whole face.